Once again, another NFL season has quickly passed us by. We are already entering championship weekend as the New England Patriots host the surprise Jacksonville Jaguars in the AFC Championship and the Minnesota Vikings go on the road to Philadelphia to battle the Eagles in the NFC Championship game. Both games having multiple storylines. With that being said, many teams hopes and dreams have already come to an end. We are inching closer to draft season as this week officially kicks off the post-season All-Star games for draft prospects — the first being the East-West Shrine Game in St. Petersburg, Florida, followed by the Senior Bowl next week in Mobile, Alabama. Rosters in both games are filled with intriguing prospects. Here is the second edition of my monthly first-round mock draft. Containing each teams needs, selections, and an explanation for each pick. It is time for the Browns to find “their guy” at quarterback. Everyone knows the awful history of draft selections that they have made in years past, but with newly hired general manager John Dorsey already having a bunch of draft capital in his pocket, this is the year where he has to select the signal caller to stamp on his early tenure in Cleveland. There’s a long process to go, but with Josh Rosen’s recent comments, it most likely will scare the team away from drafting him, instead turning their attention to Darnold. What will they do with Eli Manning? Nobody really knows. Dave Gettleman has a big decision to make. Rumors have surfaced that they’re gearing up for a two-year run with Manning, but regardless they still should draft their quarterback of the future. Rosen gives them that. He has the personality, swagger, and overflowing confidence to handle the buzz saw that is the New York media on and off of the field. Adding Rosen to an offensive core of Odell Beckham Jr., Evan Engram and Sterling Shepard is a great start for Gettleman. Let’s be honest, this roster has arguably the most holes in the entire NFL. General manager Chris Ballard has an impressive track record in previous stops, but he has a long way to go to rebuild this roster. Chubb has the potential to be a franchise cornerstone though. NC State’s all-time leader in sacks could speed up the start to the second year of their complete roster rebuild. With another pick in the top-5, Dorsey is all about adding talent no matter who it may be. This is a deep running back class, but with Isaiah Crowell all but certain to test the free agency waters and Duke Johnson not being an every down rusher, Saquon Barkley is that transcendent piece that Hue Jackson could potentially build his offense around going forward. Adding Darnold combined with Barkley makes the Browns offense considerably better than it was a season ago. Clearly one of the worst QB situations of the 2017 season was the Broncos. Paxton Lynch, Trevor Siemian and Brock Osweiler aren’t the answer. Josh Allen is one of the most polarizing prospects in this draft class.. After standing on the sideline during the Famous Idaho Potato Bowl, it’s clear that John Elway has interest in Allen. He checks all of the boxes of quarterback prospects that have interest them in years past. Josh McCown had a surprisingly positive season for the team that many thought would be drafting No. 1 overall. He’s positioned himself to be the bridge gap quarterback for at least another season. Now it is time for Todd Bowles to find his signal-caller of the future. Heisman Trophy winning QB Baker Mayfield would be a perfect fit in New York. Possessing extreme moxy, on the field leadership, and talent, Mayfield could flip the future outlook for the Jets in a hurry. After being a trendy favorite to make a huge leap in 2017, the Bucs faltered under heavy expectations. Tampa Bay could look to draft an edge rusher here, but a big reason for their failures last season was their leaky secondary, which battled injuries and some players just not living up to pre-season expectations. The T.J. Ward signing didn’t go as well as expected. Fitzpatrick improves the back end of their defense the moment he’s drafted, as he can play any position in the secondary. Ridley is the best receiver in this draft class. After not being able to showcase his talents consistently because of below average quarterback play, it was clear that when he did get his opportunities that he was exceptional. After what we saw in the 2017 draft, this may seem like a reach this early on, but the Bears desperately need talent on the perimeter for Trubisky. Newly hired head coach Matt Nagy seems adamant about surrounding his young thrower with multiple weapons. The quick emergence of Jimmy Garoppolo during the latter half of the season has expedited the 49ers rebuild. They are now in position to take the best player available on their draft board. Why not draft immediate protection for your prized investment that you traded a second-round pick for? Quenton Nelson is as safe of a prospect as there is in this entire draft class. It would not surprise me at all if he is an All-Pro selection as a rookie. He also fits Kyle Shanahan’s offensive system perfectly. There’s plenty of buzz in Oakland now that the Raiders have successfully convinced Jon Gruden to exit the broadcast booth. His press conference left you wanting to run through a wall for him. The offense is filled with a plethora of talent in many areas, but their defense is another story. Outside of Khalil Mack, they have no true difference makers. Gruden will look for play-makers. Roquan Smith provides an identity and centerpiece for the silver and black defense that they desperately have been searching for. For Gruden, the former Georgia linebacker could prove to be a similar form of Derrick Brooks on that side of the ball. The Dolphins need help at guard and edge rusher, but the value isn’t here at those spots. Another spot that they need help at is cornerback. Xavien Howard and Cordrea Tankersely are two young pieces that the team has added recently, but they both haven’t shown the developement that should make them hesitate from adding more pieces to their secondary. Denzel Ward gives them another young man-to-man corner, that has more upside that any other cover man currently on the roster. The Jake Fisher and Cedric Ogbuehi experiments have been colossal failures. This team needs talent at multiple spots, but offensive line might be the biggest. After losing Andrew Whitworth and Kevin Zeitler to free agency, the team has failed to restock the deck at offensive line. Connor Williams would potentially provide added competition to Fisher and Ogbuehi. Marvin Lewis must find a way to protect Andy Dalton. Clay Matthews will be 32 years old next season and entering the final year of a five-year, $66 million extension that he signed in 2014. With that being said, it is arguable that the Packers could look to draft an edge rusher here, but the value doesn’t seem to be there. They also need help in the secondary. Jackson provides them with another option to add alongside Kevin King and needed insurance for Quinten Rollins and Damarious Randall in case their development doesn’t improve next season. The team potentially has a huge hole to fill if they do not franchise tag Kirk Cousins for the third consecutive season. At $34.5 million, tagging Cousins would be very costly, but we’re not at the point yet, so let’s assume that Cousins stays on the roster. Safeties D.J. Swearinger and Montae Nicholson were surprise positives on the back end of the Redskins defense, but they still could get a higher end talent at those spots. Derwin James gives them an ultimate chess piece as a strong safety or as an extra linebacker in certain packages. It’s no secret that the Cardinals are starving for a quarterback. Entering 2018, with the recent retirement of Carson Palmer, there currently aren’t any on the roster under contract as Matt Barkley, Blaine Gabbert, and Drew Stanton are all scheduled to become unrestricted free agents. The roster has been on the downswing since the 49-15 loss to the Carolina Panthers in the 2016 NFC Championship game. What better way to give a jolt to that roster than to draft arguably the most electrifying prospect in this draft class. The Breshad Perriman pick can be labeled as a failure. Mike Wallace and Jeremy Maclin are set to be free agents and the team has a clear need at receiver. Joe Flacco went through an entire season without having a go to target and it ended up being one of the biggest reasons why he had the worst statistical year of his career. Sutton provides Flacco with a big body target that has a wide catch radius. Starting nose tackle Brandon Mebane will be 32 years old at the start of the 2018 season, and entering the final season of his contract. The Chargers had the second worst run defense in the NFL last season. Inserting Vita Vea at the head of the Bolts 3-4 defensive front provides an instant improvement in both areas. Vea gives the franchise a youth alternative for life after Mebane and his specialty is defending the run where the team was among the worst in the entire league. The Seahawks have shaken up their entire coaching staff, firing offensive coordinator Darrell Bevell and offensive line coach Tom Cable. Acquiring left tackle Duane Brown from the Texans was a step in the positive direction as to finding protection for their franchise quarterback in Russell Wilson. It still seems like a group that needs a lot of help though. They have to find a replacement for right tackle Germain Ifedi, who clearly was the weak link of the entire group. While very inconsistent against speedy edge rushers, Mike McGlinchey provides immediate competition for Ifedi and the hope would be that the former Notre Dame All-American can eventually overtakes Ifedi to become the starting right tackle. Rod Marinelli is very well respected around the NFL and it is clear that he loves to draft and develop defensive lineman. Defensive end Taco Charlton experienced and up and down rookie year, but flashed more during the latter half of the season. David Irving and Maliek Collins are good pieces in the middle of their defense, but they seem to be lacking a true under tackle. Hurst is arguably the best interior defensive lineman in this class and has the potential to be a plug and play starter. Matt Patricia looks to be the favorite to land the head coaching job for the the Lions and we still don’t know who his offensive coordinator will be. Speculation though is that he would like to keep offensive coordinator Jim Bob Cooter. One of the biggest questions that the team must address though is their lack of a running game. Theo Riddick and Ameer Abdullah are solid No. 2 rushers in a running back by committee rotation. The team needs a true bell-cow runner. Someone that Stafford can turn around and hand off to 20-plus times a game. Guice is without question a prospect that could fill that void. Inserting the former LSU rusher takes a lot of the heavy offensive load off of Stafford and the passing game. One of the biggest surprises of the season was the success of first year head coach Sean McDermott and the Bills. After trading Ronald Darby, Marcell Dareus and Kelvin Benjamin, many wrote off the team and accused them of purposely tanking. A 10-3 loss in the Wild Card round to the Jaguars far exceeded many’s expectations for this team. With the future seeming to be somewhat bright, their biggest questions that they have to answer are at quarterback and at spots in the middle of their defense. Da’Ron Payne improves the interior of their defense and gives them a gritty, no nonsense prospect that matches the identity of the culture that McDermott is attempting to build upon. With consecutive picks, the Bills will obviously be looking to draft a quarterback, but with the top prospects that are first-round worthy all gone, picking one here would be a massive reach. 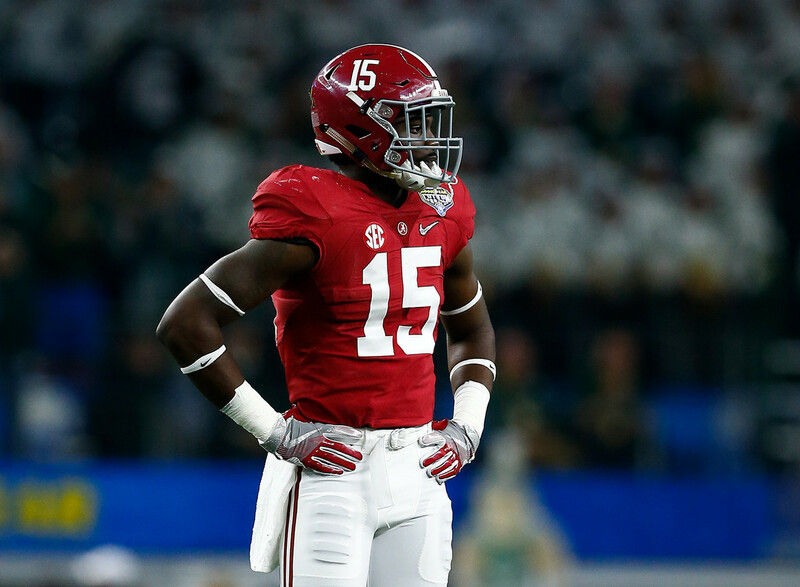 They should continue to improve building upon the interior of their defense and draft Payne’s teammate in Rashaan Evans. After being at the center of Nick Saban’s national championship defense, Evans translates well to McDermott’s defensive scheme. He is a versatile linebacker that also can be used as an edge rusher. One of the biggest surprises of the 2017 season was the instant turnaround of the now Los Angeles Rams and first year head coach Sean McVay. The offense was a juggernaut throughout the season and rightfully so with so many additions prior to the season. Now it is time to focus their efforts on the defense. Locking up Aaron Donald seems to be a priority. The teams top three cover corners, Trumaine Johnson, Lamarcus Joyner, and Nickell Robey-Coleman are set to become free agents. All three will cost a lot of money and it is unlikely that all will be re-signed. Set to lose someone, the team has to address cornerback. With great length, ball skills and tremendous upside, Oliver is an ideal fit and a solid value selection at this point in the draft. The Panthers could address receiver here, but spending multiple draft picks in 2017 on the offense and with Thomas Davis already coming out and saying that 2018 will be his final season, it is logical to think that they will put a heavy emphasis on improving their defense. Julius Peppers is set to be a free agent and Charles Johnson has troubles staying on the field, leaving Mario Addison as the teams only reliable edge rusher on the roster. Marcus Davenport is a high upside pick and he surely is a prospect that will rise up draft boards the closer we get to April. The former UTSA edge rusher is a perfect fit and is a pick that could pay dividends later on down the road. The Titans made a surprising coaching change, firing head coach Mike Mularkey. Patriots offensive coordinator Josh McDaniels is believed to be the favorite. Whoever overtakes this job clearly understands that there are plenty of positive pieces on offense, but their defense needs upgrades and depth at multiple positions. There are lots of off the field questions surrounding Arden Key and that will most likely be some of the biggest reasons why he experiences a fall in the draft. The edge rushers talent is other worldly though and why he most likely will be a first-round selection. After a promising season that ended in a divisional round loss to the Patriots, the Titans still have to make significant improvements on their defense. Getting a value pick in Key gives them help on the edge that they need. The Falcons defense is filled with young stars on all three levels. Grady Jarrett, Deion Jones and Keanu Neal all seem to be franchise cornerstones for years to come, but Dan Quinn’s defense could use an upgrade at safety. Known to look for players that possess alpha mentalities and are tone setters, Ronnie Harrison fits that mold perfectly. Known as one of the vocal leaders on Alabama’s defense, pairing him on the roof of the defense alongside Neal potentially gives the Falcons one of the best young safety tandems in the entire league. A heartbreaking 29-24 loss to the Vikings ended the Saints season abruptly. Their offense is loaded and the 2017 draft class set the bar extremely high entering this off-season. Arguably one of the biggest risers throughout the early portion of draft season has been the former Gator interior defender, Known for his relentlessness and non-stop motor, pairing Bryan with 2016 first-round selection Sheldon Rankins makes a formidable tandem up the middle of Sean Payton’s defense. Edmunds is a name that will continue to rise as his measurables are off the chart and his potential is through the roof. At 6-5, 250 pounds, he possesses rare size for an inside linebacker and is a prospect that can play multiple positions. After losing Ryan Shazier, it was evident that the Steelers lacked depth on the second level of their defense. Edmunds athleticism and quickness are traits that the team will highly covet. Tom Coughlin has copied the blueprint that helped him winSuper Bowls with the New York Giants. Developing a suffocating defense and a dominant running game has made the Jaguars quarterback proof and they are on their well to playing in the AFC Championship game against the New England Patriots. Blake Bortles has the team on a championship run and the team could definitely use an upgrade at quarterback, but another hole on the roster is at tight end. Mercedes Lewis and Ben Koyack are the two top tight ends on the roster. Andrews doesn’t provide much value as an in-line run blocker, but he is a big target in the passing game that could win from attached sets and out on the perimeter. From top to bottom, there aren’t many needs on the Vikings roster. General manager Rick Spielman has done a solid job of drafting and filling the teams roster with talent throughout his tenure. One of the most glaring holes though is at defensive tackle. Tom Johnson is set to become an unrestricted free agent, combined with turning 34 years old next season, 2017 third-round selection Jaleel Johnson hasn’t seen the field very much and Sharrif Floyd is a relatively unknown since having complications from a surgical procedure on his knee. Wilkins is a name that has taken a bit of a tumble over the past few months because of his hot and cold motor. The Vikings are a team that is known to take advantage of prospects that one were once heavily sought after, but somehow experience draft day slides. Wilkins is the most recent case in this scenario. With Jason Peters coming off knee surgery and having a $10.6 million cap hit in 2018, it would be wise for the Eagles to start preparing for life after Peters. Similar to Peters, Orlando Brown is a massive prospect. At 6-7, 345 pounds, Brown is best suited at right tackle, which allows the team to shift Lane Johnson to being their blindside protector for multiple years. Having Peters, Johnson and adding Brown to have as your bookends is very admirable for Philadelphia to protect Carson Wentz, who is coming off a knee injury of his own. The Patriots are in position to take the best player available on their board. They rarely ever have flashy names throughout the entire roster, but they have personnel that always has high belief in the scheme that they are placed in. Landry is a prospect that fits the Patriots way perfectly. Specializing as a pass rusher, pressure off of the edge is an area where the franchise could use more help at. For more NFL Draft news and analysis, follow J.R. on Twitter @JReidDraftScout.